The rate of global mean sea-level rise (~3 mm/yr; SLR) has accelerated compared to the mean of the 20th century (~2 mm/yr), but the rate of rise is locally variable. Factors contributing to SLR include decreased global ice volume and warming of the ocean. On Greenland, the deficiency between annual ice gained and lost tripled between 1996 and 2007. On Antarctica the deficiency increased by 75%. Mountain glaciers are retreating and the cumulative mean thickness change has accelerated from about −1.8 to −4 m in 1965 to 1970 to about −12 to −14 m in the first decade of the 21st century. 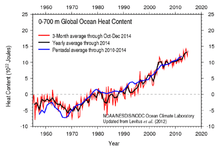 From 1961 to 2003, ocean temperatures to a depth of 700 m increased and portions of the deeper ocean are warming. The Intergovernmental Panel on Climate Change (2007) projected sea level would reach 0.18 to 0.59 m above present by the end of the 21st century but lacked an estimate of ice flow dynamics calving. Calving was added by Pfeffer et al. (2008) indicating 0.8 to 2 m of SLR by 2100 (favouring the low end of this range). Rahmstorf (2007) estimated SLR will reach 0.5 to 1.4 m by the end of the century. Pielke (2008) points out that observed SLR has exceeded the best case projections thus far. These approximations and others indicate that global mean SLR may reach 1 m by the end of this century. However, sea level is highly variable and planners considering local impacts must take this variability into account. 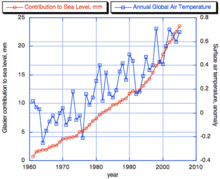 Global mean air temperature is increasing in relation to global warming. As a result, Earth’s ice volume is decreasing and the heat content of the ocean is increasing. 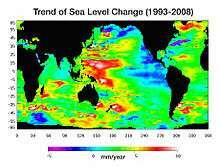 Global mean sea level is therefore rising, and the rate of rise has accelerated. Sea-level rise (SLR) presents challenges to coastal communities and ecosystems, and planners are engaged in assessing management options. Accordingly, it is desirable to have an estimate of SLR this century to properly design mitigation and adaptation strategies. An approximation of SLR by the end of the century will allow: 1) estimates of coastal erosion and changes in vulnerability to coastal hazards; 2) assessments of threats to coastal ecosystems; and 3) development of climate risk management policies. This paper reviews recent studies of global warming, sea-level observations, global ice volume, ocean heating, and estimates of SLR by the end of the 21st century. Based on current scientific understanding, we conclude that a global mean rise of approximately 1 m around the end of the century is indicated by present research and constitutes an appropriate planning target at this time. However, sea-level rise will have important local variability that planners should consider as knowledge of that variability improves. Global mean sea-level may rise significantly more than 1 m, but is unlikely to raise significantly less. Important questions remain regarding the melt rate of ice in West Antarctica and southern Greenland. Also unknown are the actual levels of natural climate variability and greenhouse gas accumulation that will be reached this century. However, even if atmospheric composition were stabilized today, global warming and SLR would continue. Avoiding these changes requires, eventually, a reduction in emissions to substantially below present levels. Heat-trapping gases such as carbon dioxide, methane, and others have increased in atmospheric abundance due to human industrial activities driving a global trend of atmospheric warming (, Figure 1). Measurements indicate that the amount of carbon dioxide and other greenhouse gases in the atmosphere have increased over the past century and exceed levels of the past 650,000 years as measured by ice cores from Antarctica. Measurements also indicate that global atmospheric temperature has risen 0.74 ± 0.18 °C during the 100 years ending in 2005, while precipitation (expected to increase in a warmer atmosphere) rose 1.4 ± 0.5% per decade. The calendar year 2007 tied 1998 as the second warmest year on the instrumental record (beginning 1880) while 2005 was the warmest. This is remarkable considering that 2007 was a cool La Niña year and a time of low solar activity (the lowest in twenty years) and 1998 was a strong El Niño year characterized by high solar activity. Calendar year 2008, the coolest year since 2000, was nonetheless the 9th warmest year in the period of instrumental observations. Notably, the ten warmest years all occur within the 12-year period 1997–2008. The annual growth rate of climate forcing by long-lived greenhouse gases slowed from a peak close to 0.05 W/m2 per year around 1980–85 to about 0.035 W/m2 in recent years due to slowdown of CH4 and CFC growth rates. Resumed methane growth, if it continued in 2008 as in 2007, adds about 0.005 W/m2. From climate models and empirical analyses, this forcing trend translates into a mean warming rate of ~0.15 °C per decade. Warming water and melting land ice have raised global mean sea level 4.5 cm from 1993 to 2008 at a rate of about 3 mm/yr. However, the rise is not uniform. This image, created with sea surface height data from the Topex/Poseidon and Jason-1 satellites, shows where sea level has changed during this time and how quickly these changes have occurred. 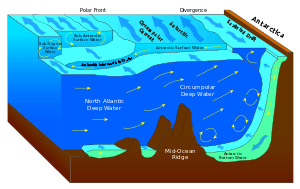 The complex surface temperatures reflect the influence of warm and cool bodies of water, currents, and winds. Top panel: Tide gauge derived global sea level trends estimated over 15 year segments and plotted versus the mid-year of the segment. One standard error is indicated by the shaded region. Bottom panel: The average sea level trend in each 10° latitude band as a function of the mid-year of the 15 year window used to compute the trend. The trends are multiplied by the fraction of total ocean surface area (−60° to 60°) in each latitude band. Radar altimeters can measure the sea surface from space to within a few centimeters. The TOPEX/Poseidon mission (launched in 1992) and its successors Jason-1 (2001) and Jason-2 (2008) have mapped the sea surface approximately every 10 days for 16 yrs. The mission has led to major advances in physical oceanography and climate studies. Altimeter measurements indicate that global mean sea level has risen 4.5 cm from 1993 to 2008 at a rate of approximately 3 mm/yr (3.2 ± -0.4 mm/yr;). However, this rise is not uniform across the oceans. Figure 2 shows a map of altimeter measurements depicting the rate of sea-level change since 1993. Rates are contoured by color: light blue indicates regions where sea level has been relatively stable; green, yellow and red show areas of sea-level rise; blue and purple indicate areas of sea-level fall. This complex surface pattern largely reflects wind-driven changes in the thickness of the upper layer of the ocean, and to a lesser extent changes in upper ocean heat content driven by surface fluxes. Most noticeable on the map, sea-level rise in the western Pacific approaches 10 mm/yr. This pool of rising water has the signature shape of La Niña conditions in the tropical Pacific. The sea-level buildup in the western Pacific coincides with the absence of strong El Niño events, with the last occurring during 1997–98. The PDO (Pacific Decadal Oscillation) is a basin-wide climate pattern consisting of two phases, each commonly lasting 10 to 30 years. In a positive phase of the PDO, surface waters in the western Pacific above 20° N latitude tend to be cool, while equatorial waters in the central and eastern Pacific tend to be warm. In a negative phase, the opposite pattern develops. Hence, rapid sea-level rise in the western Pacific matches the current negative phase of the PDO. The degree to which this pattern contributes to the global mean rate of sea-level rise observed in satellite altimetry is not known. Another important source of sea-level observations comes from the global network of tide gauges. Church and White (2006) used this network in combination with satellite altimeter data to establish that global mean sea-level rose 19.5 cm between 1870 and 2004 at an average rate of about 1.44 mm/yr (1.7 mm/yr during the 20th century). The SLR trend increases over this period, with a notable slope change around 1930, resulting in a significant acceleration of 0.013 ± 0.006 mm yr-2. This is an important confirmation of climate change simulations predicting that SLR will accelerate in response to global warming. If this acceleration remains constant then the amount of rise from 1990 to 2100 will range from 28 to 34 cm. This is consistent with model results in which global average sea level was projected to rise 18 to 59 cm by 2100. Church and White (2006) note that the recent increase in SLR at the end of the 20th century is not statistically distinguishable from decadal variations in sea level that have occurred throughout the record. However, further work with long tide gauges records revealed that sea level acceleration may have started earlier, over 200 years ago. 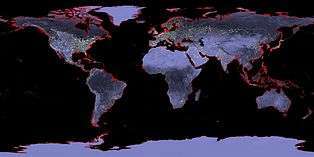 They reconstructed global mean sea level since 1700 from tide gauge records and concluded that sea-level acceleration up to the present has been about 0.01 mm yr−2; and began at the end of the 18th century. Sea level rose by 6 cm during the 19th century and 19 cm in the 20th century. They also discovered quasi-periodic fluctuations with a period of about 60 yr superimposed on the long-term history. On the basis of this analysis, they conclude that if the conditions that established the acceleration continue, then sea level will rise 34 cm over the 21st century. In their 4th assessment of global climate change, the IPCC (2007) reported that SLR since 1961 has averaged 1.8 (1.3 to 2.3) mm/yr and since 1993 it has averaged 3.1 (2.4 to 3.8) mm/yr, with contributions from thermal expansion, melting glaciers and ice caps, and the polar ice sheets. However, they caution that it is unclear if the faster rate since 1993 reflects decadal variation or an increase in the longer-term trend. Merrifield et al. (in press) examine an area weighted average of tide gauge trends and conclude that the recent sea-level acceleration reflects an anomalous trend increase that is distinct from a decadal variation(Figure 3). Increased rates in the tropical and southern oceans primarily account for the acceleration. The timing of the global acceleration corresponds to similar sea level trend changes associated with upper ocean heat and ice melt. Whether the recent change is associated with the 60 year variations noted by Jevrejeva et al. (2008) remains unclear. Reconstruction of Antarctic surface temperature trends for 1957–2006. Overall, the continent is warming by about 0.1 °C per decade. Heat in the atmosphere leads to melting of glaciers and sea ice, a decrease in the extent of snow cover, and shifts from snowfall to rainfall. Melting of glacier ice and snow contribute to SLR, whereas melting sea ice does not directly contribute to sea-level rise because it already displaces its own mass in the oceans. However, as sea ice retreats, more dark open water is exposed to absorb heat from the atmosphere and from the Sun, contributing to heating of the Arctic and Antarctic and further encouraging SLR. According to scientists from the National Snow and Ice Data Center in Boulder retreating ice cover in the Arctic Ocean, long held to be an early warning of warming climate, shattered the all-time low record in the summer of 2007, and nearly matched it again in 2008. Using satellite imagery, researchers now estimate that the summer Arctic ice pack covers 4.2 million km2, equal to just less than half the size of the United States. This is about 20% less than the previous all-time low record of 5 million km2 set in September 2005. Scientists describe the loss as “astounding,” the most dramatic loss observed in the history of watching the Arctic ice pack. Most researchers had anticipated the disappearance of the summer ice pack after the year 2070, but now they speculate that losing summer ice cover by 2030 – or even earlier – is not unreasonable. Thus the stage is set for what scientists refer to as an “albedo flip.” Albedo is a measure of the reflectivity of Earth’s surface. That is, the former heat-reflecting ice surface will become a heat-absorbing body of water. Until recently, the contribution of the Greenland continental glacier to sea-level rise has been unknown. Now, however, increased melting of the Greenland ice sheet (Figure 4) has been observed and it is known that the glacier is getting smaller. The balance between annual ice gained and lost is in deficit and the deficiency tripled between 1996 and 2007. In Greenland, the year 2007 marked a rise to record levels of the summertime melting trend over the highest altitudes of the Greenland ice sheet. Melting in areas above 2000 m rose 150% above the long-term average, with melting occurring on twenty-five to thirty more days in 2007 than the average in the previous nineteen years. Scientists have found that glaciers in southern Greenland are flowing 30% to 210% faster than they were ten years ago, and the overall amount of ice discharged into the sea has increased from 21 km3 in 1996 to 54 cubic km3 in 2005, an increase of 250%. Greenland's contribution to average sea-level rise increased from 2.3 mm per decade in 1996 to 5 mm per decade in 2005. This accounts for between 20% and 38% of the observed yearly global sea-level rise. Two-thirds of Greenland's sea level contribution is due to glacier dynamics (chunks of ice breaking off and melting), and one-third is from direct melting. As glacier acceleration continues to spread northward from its current focus in southern Greenland, the global sea-level rise contribution from the world’s largest island will continue to increase. Antarctica consists of three main geographic regions: the Antarctic Peninsula, West Antarctica, and East Antarctica. In West Antarctica, which has warmed 0.17 °C per decade at the same time that global warming was 0.13 °C per decade, ice loss has increased by 59% in the early 21st century to about 132 billion metric tons per year. The yearly loss along the Antarctic Peninsula has increased by 140% to 60 billion metric tons. The East Antarctic ice sheet, by far the largest region of the continent, has an ice budget that is overall stable to slightly melting. It is experiencing melting along the coastal margin in warming seas and snow accumulation in the hinterlands. Overall the entire continent of Antarctica is experiencing net melting. All three regions of Antarctica are warming (Figure 4) and overall ice loss in Antarctica increased by 75% in the past 10 years. Alpine and other types of mountain glaciers are also retreating (Figure 5). In fact, for the millions of people that depend on seasonal ice melting as a source of freshwater, the retreat and eventual loss of this ice delivers a fundamental blow to the sustainability of communities. Mountain glaciers are retreating around the globe and the cumulative mean thickness change has accelerated from about −1.8 to −4 m in 1965 to 1970 to about −12 to −14 m of thinning in the first decade of the 21st century. Average annual and cumulative alpine (mountain) glacier thickness change, measured in vertical meters, since 1961. These results indicate that, in most regions of the world, glaciers are shrinking in mass. From 1961 to 2005, the thickness of "small" glaciers decreased approximately 12 m.
Cumulative contribution to sea level from small glaciers and ice caps (red) plotted with the annual global surface air temperature anomaly (blue). Image courtesy Mark Dyurgerov, Institute of Arctic and Alpine Research, University of Colorado, Boulder. In their 4th assessment of global climate change, the IPCC (2007) estimated that the sum of all contributions to sea-level rise for the period 1961–2004 equaled 1.1 ± 0.5 mm/yr. The observed sea-level rise over the same period was 1.8 ± 0.5 mm/yr, thus leaving 0.7 ± 0.7 unexplained. To close this gap, researchers computed the global surface mass balance of all mountain glaciers and ice caps and found that part of the missing sea level component can be attributed to mass loss from this source, especially around the Antarctic Peninsula. They estimate that mountain glaciers and ice caps account for 0.79 ± 0.34 mm/yr of sea-level rise compared to 0.50 ± 0.18 mm/yr estimated in the IPCC (2007). Antarctic mountain glaciers contribute 28% of this. The global ocean heat content, 1955–2008. In terms of heat content, it is the world ocean that dominates atmospheric climate. The oceans store more than 90% of the heat in Earth's climate system and act as a buffer against the effects of climate change. For instance, an average temperature increase of the entire world ocean by 0.01 °C may seem small, but in fact it represents a very large increase in heat content. If all the heat associated with this anomaly was instantaneously transferred to the entire global atmosphere it would increase the average temperature of the atmosphere by approximately 10 °C. Thus, a small change in the mean temperature of the ocean represents a very large change in the total heat content of the climate system. Of course, when the ocean gains heat (Figure 6), the water expands and this represents a component of global sea-level rise. Understanding how ocean warming and the resulting thermal expansion contribute to SLR is critically important to understanding climate change, and forecasting future temperature rises. Researchers found that from 1961 to 2003, ocean temperatures to a depth of 700 m contributed to an average rise in sea levels of about 0.52 mm/yr compared to a rise of 0.32 mm/yr reported by the IPCC (2007). Although recent warming is greatest in the upper ocean, observations also indicate the deeper portions of the oceans are warming, estimated to cause sea-level rise of about 0.2 mm/yr. Over the period 1961–2003, alpine glaciers and ice caps contributed an estimated 0.5 mm/yr to global sea-level rise, increasing to 0.8 mm/yr for the period 1993–2003. The IPCC estimated the contributions of ice loss on Greenland (about 0.21 mm/yr) and Antarctica (about 0.21 mm/yr) to global sea level. By summing these various components of sea-level rise, Domingues (2008) found that from 1961 to 2003 the sea-level rise “budget” totaled about 1.5 ± 0.4 mm/yr. This agreed with their estimate of mean sea-level rise over the same period using observational tide gauge data (1.6 ± -0.2 mm/yr). IPCC (2007) predicts that by 2100 sea level will rise between 18 and 59 cm, but does not include a component for ice calving (ice-sheet dynamic processes). The missing component was added by Pfeffer et al. (2008) who conclude that by 2100 sea level will rise between 0.8 and 2 m, preferring the lower end of the range. The Intergovernmental Panel on Climate Change (2007) has predicted future sea-level changes to the year 2100. They are not the first body to attempt this important exercise, nor are their latest results their first attempt. Their estimate forecasts a range of global SLR from 18 to 59 cm by the end of this century. These projections are based on thermal expansion due to ocean heating and ice melting, but do not include a component based on ice sheet dynamics (calving). Hence, it is understood that they underestimate the potential for flooding due to rising seas by the end of the century. Overall, these observational data underscore the concerns about global climate change. Previous projections, as summarized by IPCC, have not exaggerated but may in some respects even have underestimated the change, in particular for sea level. In his other paper in 2007, Rahmstorf estimates 21st century sea-level change on the historical relationship between 20th century temperature changes and sea-level changes. He presents the empirical relationship that connects global sea-level rise to global mean surface temperature over the period 1880–2000 and proposes that, for time scales relevant to global warming, the rate of sea-level rise is roughly proportional to the magnitude of warming above the temperatures of the pre–Industrial Age. The study establishes a proportionality of 3.4 mm/yr of sea-level rise per oC of global temperature warming. When applied to IPCC (2001) warming scenarios at the end of the century (1.4° to 5.8 °C), this relationship results in a projected sea-level rise in 2100 of 0.5 to 1.4 m above the 1990 level with a mean of 0.95 m.
This estimate is confirmed by Pfeffer et al. (2008) who examine the physics of ice calving. Estimates of ice calving were absent in the 2007 IPCC report. 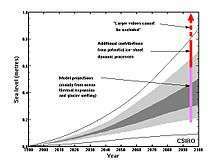 Pfeffer adds estimates of SLR due to thermal expansion and ice melting to calving approximations and concludes that SLR by the end of the century will range 0.8 to 2.0 m above present with an emphasis on the lower area of this range (Figure 7). On the basis of the work by Rahmstorf and Pfeffer et al., the observed accumulation of heat in the ocean, and the acceleration of melting, there is a building consensus among scientists that SLR will approach and perhaps pass 1 m by the end of the 21st century. For instance, members of the 2009 International Scientific Congress on Climate Change held at University of Copenhagen 10–12 March released a press statement titled “Rising sea levels set to have major impacts around the world.” Conference delegates stated “Research presented today at the International Scientific Congress on Climate Change in Copenhagen shows that the upper range of sea level rise by 2100 could be in the range of about one meter, or possibly more.” A key member of the congress was Dr. John Church who pointed out that sea level is currently rising at a rate that is above any of the model projections of 18 to 59 cm provided by the IPCC (2007). If greenhouse gas concentrations were stabilized today, sea level would nonetheless continue to rise for hundreds of years. After 500 years, sea-level rise from thermal expansion alone may have reached only half of its eventual level, which models suggest may lie within ranges of 0.5 to 2 m. Glacier retreat will continue and the loss of a substantial fraction of Earth’s total glacier mass is likely. 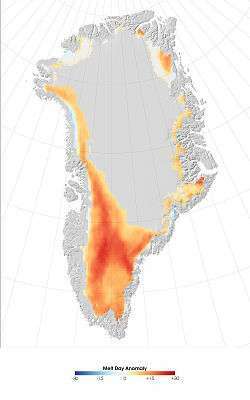 Areas that are currently marginally glaciated are likely to become ice-free. But it is unlikely that greenhouse gases will be stabilized soon, so we can probably count on additional atmospheric heating – and sea-level rise. Pielke (2008) points out that observed SLR has exceeded the best case projections thus far. Research also suggests that Earth’s warming temperatures may be on track to melt the Greenland and Antarctic ice sheets sooner than previously thought and ultimately lead to a global sea-level rise of at least 6 m. Researchers found that if the current warming trends continue, by 2100 Earth will likely be at least 4 °C warmer than present, with the Arctic at least as warm as it was nearly 130,000 years ago when the Greenland ice sheet was a mere fragment of its present size. Study leader Jonathan T. Overpeck of the University of Arizona in Tucson said, "The last time the Arctic was significantly warmer than present day, the Greenland Ice Sheet melted back the equivalent of about 2 to 3 m of sea level." The research also suggests the Antarctic ice sheet melted substantially, contributing another 2 to 3 m of sea-level rise. The ice sheets are melting already. The new research suggests melting could accelerate, thereby raising sea level as fast as, or faster than, 1 m per century. A 2013 study of past sea levels estimated that "we are committed to a sea-level rise of approximately 2.3 meters per °C within the next 2,000 years." Global warming and its consequences present new challenges to modern society. Among these is a degree of uncertainty among scientists about how to communicate the dramatic environmental changes that may be in store. For example, in 2007 James Hansen of the NASA Goddard Institute for Space Studies published a paper about scientific reticence in Environmental Research Letters, an on-line science journal open to the public. He proposed that normally quite articulate scientists become reluctant to communicate the full threat of potentially large and damaging future sea-level rise out of a misplaced sense of scientific conservatism. We may rue reticence, if it serves to lock in future disasters. He describes how a scientist who has made an important discovery may have concerns about the danger of “crying wolf” and that this danger is more immediate in the scientist's mind than concern about the danger of “fiddling while Rome burns”. He cites studies of human behavior that show a preference for immediate over delayed rewards, which may contribute to irrational reticence even among rational scientists. Global SLR has accelerated in response to warming of the atmosphere and the ocean, and melting of the cryosphere. Projections indicate that a 1 m rise by the end of this century is possible. Pielke (2008) points out that observed SLR has exceeded the best estimate projections thus far. Satellite altimetry suggests that sea-level rise will have significant local variability that is worthy of continued research to improve understanding. Planners should consider this variability as impacts will be scaled to local SLR. 1 2 Rahmstorf, S. (2007). "A Semi-Empirical Approach to Projecting Future Sea-Level Rise". Science. 315 (5810): 368–70. Bibcode:2007Sci...315..368R. doi:10.1126/science.1135456. PMID 17170254. 1 2 3 Pielke, R.A. (2008). "Climate Predictions and Observations". Nature Geoscience. 1 (4): 206. Bibcode:2008NatGe...1..206P. doi:10.1038/ngeo157. ↑ Zwally, H.J. ; Breener, A.C.; Beckley, M.A. ; Cornejo, H.G. ; Giovinetto, M.B. ; Li, J.; Luthcke, S.B. ; Saba, J.L. ; Yi, D. (2008). 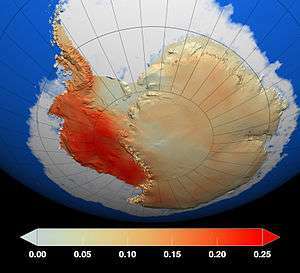 "Greenland and Antarctic Ice Sheet Mass Balance from ICESat (2003–2007)". Eos, Transactions, American Geophysical Union. 89 (53): Fall meeting supplement, abstract: C43A–08. 1 2 3 Steig, E. J.; Schneider, D. P.; Rutherford, S. D.; Mann, M. E.; Comiso, J. C.; Shindell, D. T. (2009). "Warming of the Antarctic ice-sheet surface since the 1957 International Geophysical Year". Nature. 457 (7228): 459–462. Bibcode:2009Natur.457..459S. doi:10.1038/nature07669. PMID 19158794. 1 2 3 Jevrejeva, S.; Moore, J. C.; Grinsted, A.; and Woodworth, P.L. (2008). "Recent global sea level acceleration started over 200 years ago?". Geophysical Research Letters. 35 (8): L08715. Bibcode:2008GeoRL..3508715J. doi:10.1029/2008GL033611. 1 2 3 Merrifield, M.A. ; Merrifield, S.T; Mitchum, G.T. 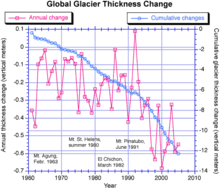 "An anomalous recent acceleration of global sea level rise". Journal of Climate. 22: 5772–5781. Bibcode:2009JCli...22.5772M. doi:10.1175/2009jcli2985.1. 1 2 3 Hansen, J.E. (April–June 2007). "Scientific reticence and sea-level rise". Environmental Research Letters. 2 (2): 024002. arXiv:physics/0703220 . Bibcode:2007ERL.....2b4002H. doi:10.1088/1748-9326/2/2/024002. 1 2 Wigley, T.M.L. (2005). "The Climate Change Commitment". Science. 307 (5716): 1766–9. Bibcode:2005Sci...307.1766W. doi:10.1126/science.1103934. PMID 15774756. 1 2 Jet Propulsion Laboratory (2009) Last viewed 22 May 2009 "Ocean surface topography from space"; "Rising waters: new map pinpoints areas of sea-level increase"
↑ National Snow and Ice Data Center (2009) Arctic Sea Ice News and Analysis; last viewed 22 May 2009. ↑ Earth Observatory Press Release (2009) "Global Glacier Melt Continues" 29 January; Last viewed 25 May 2009, . ↑ Rignot, E.; Bamber, J. L.; Van Den Broeke, M. R.; Davis, C.; Li, Y.; Van De Berg, W. J.; Van Meijgaard, E. (2008). "Recent Antarctic ice mass loss from radar interferometry and regional climate modelling". Nature Geoscience. 1 (2): 106. Bibcode:2008NatGe...1..106R. doi:10.1038/ngeo102. ↑ Meier, M. F.; Dyurgerov, M.B. ; Rick, U.K.; O’Neel, S.; Pfeffer, W.T. ; Anderson, R.S. ; Anderson, S.P. & Glazovsky, A.F. (2007). "Glaciers dominate eustatic sea-level rise in the 21st century". Science. 317 (5841): 1064–7. Bibcode:2007Sci...317.1064M. doi:10.1126/science.1143906. PMID 17641167. 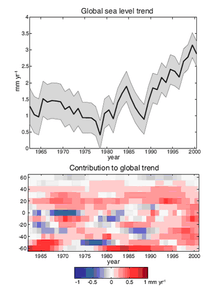 ↑ Levitus, S., Boyer, T., Antonov, J., Garcia, H., and Locarnini, R. (2005) Ocean Warming 1955–2003. Poster presented at the U.S. Climate Change Science Program Workshop, 14–16 November 2005, Arlington VA, Climate Science in Support of Decision-Making; Last viewed 22 May 2009 . ↑ Johnson, G. C.; Mecking, S.; Sloyan, B. M.; Wijffels, S. E. (2007). "Recent bottom water warming in the Pacific Ocean". Journal of Climate. 20: 5365–5375. Bibcode:2007JCli...20.5365J. doi:10.1175/2007JCLI1879.1. ↑ Dyurgerov, M. B.; Meier, M. F. (2005). "Glaciers and the Changing Earth System: A 2004 Snapshot". Institute of Arctic and Alpine Research, University of Colorado. Occasional Paper 58. ↑ Overpeck, J.; Otto-Bliesner, B.L. ; Miller, G.H. ; Muhs, D.R. ; Alley, R.B. ; Kiehl, J.T. (2006). "Paleoclimatic Evidence for Future Ice-Sheet Instability and Rapid Sea-Level Rise". Science. 311 (5768): 1698–1701. doi:10.1126/science.311.5768.1698. PMID 16556815. ↑ Levermann, A.; et al. (2013). "The multimillennial sea-level commitment of global warming". Proceedings of the National Academy of Sciences. 110: 13745–13750. Bibcode:2013PNAS..11013745L. doi:10.1073/pnas.1219414110.